The cruise control system (CCS) maintains a constant speed above 25 km/h, once it has been set, without you having to depress the accelerator pedal. cluster lights up when the cruise control system is switched on. For safety reasons, the cruise control system must not be used in dense traffic or on unfavourable road surfaces (such as icy roads, slippery roads, loose gravel) – there is a risk of an accident. The saved speed may only be resumed if it is not too high for the current traffic conditions. Always deactivate the cruise control system after use to prevent the system being enabled unintentionally. The cruise control system is not able to maintain a constant speed when driving in areas with steeper gradients. The weight of the vehicle increases the speed at which it travels. Therefore, shift to a lower gear in good time or slow the vehicle down by applying the foot brake. It is not possible to switch on the cruise control system on vehicles fitted with a manual gearbox if first gear or reverse gear is engaged. It is not possible on vehicles fitted with an automatic gearbox to switch on the cruise control system if the selector lever is in the position P, N or R.
The cruise control system may automatically switch off when some brake assist systems (e.g. ESC) intervene, when the speed exceeds maximum permissible engine speed, or a similar event takes place. Press switch A » Fig. 114 to the ON position. After the desired speed has been reached, press the rocker button B into the SET position. After you have released the rocker button B out of the position SET, the speed you have just stored is maintained at a constant speed without having to depress the accelerator. Depress the accelerator to increase the speed. Release the accelerator to reduce the speed back down to the preset speed. However, if the saved speed is exceeded by more than 10 km/h for a period of more than 5 minutes by depressing the accelerator, the stored speed is deleted from the memory. The speed must then be saved again. Press rocker button B » Fig. 114 on page 118 to the RES position. The speed will increase continuously, if the rocker button is pressed and held in the RES position. Release the rocker button once the desired speed is reached. The set speed is then stored in the memory. The stored speed can be reduced by pressing rocker button B » Fig. 114 on page 118 to the SET position. The speed will decrease continuously, if the rocker button is pressed and held in the SET position. Release the rocker button once the desired speed is reached. The set speed is then stored in the memory. If the rocker button is released at a speed below around 25 km/h, the speed is not stored and the memory is erased. The speed must then be stored again by pressing rocker button B to the SET position after increasing the speed of the vehicle to more than around 25 km/h. The speed can also be reduced by depressing the brake pedal, which temporarily deactivates the system. The cruise control system can be temporarily switched off by pushing switch A » Fig. 114 on page 118 to the spring-loaded CANCEL position or by depressing the brake or clutch pedal. The set speed remains stored in the memory. 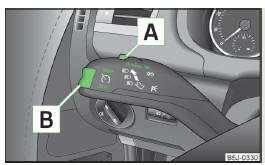 Briefly push rocker button B to the RES position to resume the set speed after the clutch or brake pedal is released. Press switch A » Fig. 114 on page 118 to the right to the OFF position.